View full 2018 Eldora Dirt Derby results below. 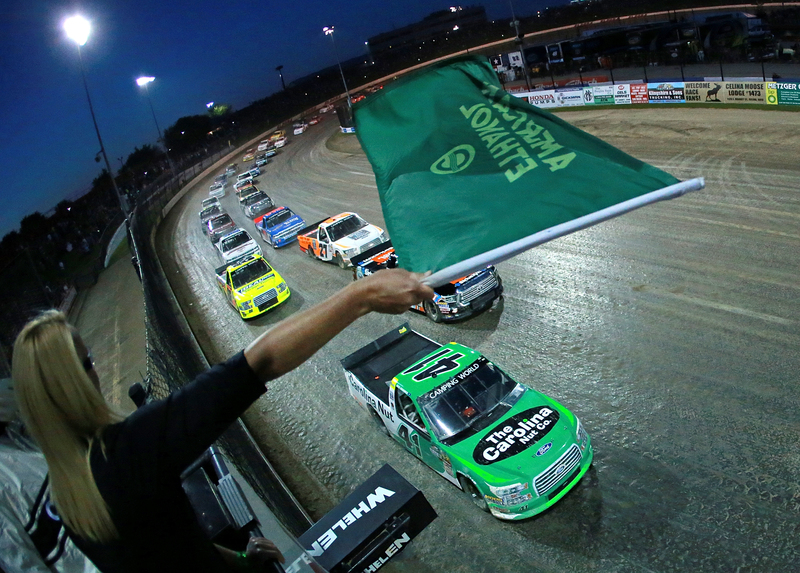 Ben Rhodes and Sheldon Creed will lead the field to the green flag in heat race number 1 at Eldora Speedway. Green, Creed was leading by a truck length before they took the green flag. Lap 1, Braden Mitchell is around in turn 3. Creed is sent to the tail of the field. Green, Austin Wayne Self leads Shipley into turn 1. Lots of fender banging for 4th on back, bumpers are hanging. Creed is knocking the wall down to find his way back to the front. 6 to go, Rhodes looks to the outside in turn 1. He jumps to the lead. 4 to go, the caution is out for Ciccarelli who pulls to the pit area. Green, Rhodes and Creed head side by side into turn 1. Side by side off turn 2 and into turn 3. Creed runs the bottom as they bang fenders and fight for space. 2 to go, Rhodes noses ahead. Final corner, Creed looks to the outside but he can’t get to his right rear. Rhodes wins the race back to the start finish line and takes the win in the first heat race of the night! Logan Seavey and Todd Gilliland set row one in heat two at Eldora. Green, Seavy gets the jump, he leads into turn 1. Lap 5, Seavey has checked out to over a 1 second lead. Ty Dillon is running the cushion and lifting the left front off the track to try and fill the final transfer position. 3 to go, Tanner Thorson is around, the caution is out. Green, Seavey leads into turn 1 on the bottom. Gilliland is making the top work this time! He makes up ground on the outside of turn 2. They run even into turn 3. Gilliland noses ahead and takes the lead! Todd Gilliland wins heat race number two! Tyler Dippel and Chris Windom trail the pace truck ahead of heat race number three. Green, Dippel leads into turn 1. They split Windom as he falls to 3rd. The field is taking a wide entry into turn 1 with a late apex. That’s the keep the momentum up. Briscoe takes the lead! Gragson bounces off the wall as Norm Benning takes over 4th. Gragson is under fire from the dirt regular, Kyle Strickler. 2 to go, Benning wiggles and they both close. Gragson is on the brakes to avoid Benning, Strickler drives by to take the final transfer spot. Briscoe takes the win in heat race number three! Grant Enfinger and Matt Crafton lead the field coming to the flag stand. Green, Crafton leads into turn 1. Nick Hoffman runs 3rd! 5 to go, Crafton leads by 3 car lengths. Enfinger is maintaining the gap. Matt Crafton wins the fourth heat race at Eldora Speedway! Stewart Friesen and Ryan Newman will lead them to the start in the final heat race of the night at Eldora Speedway. Green, Friesen leads on the outside in turn 1. Newman holds second and follows the lead to the outside lane. 5 to go, Newman runs right on the back bumper of Friesen. They’re both glued to the wall. Newman spins the tires off turn 2 and loses a truck length. Friesen takes the win in the final heat race of the night at Eldora Speedway. John Hunter Nemechek and RJ Otto Jr will lead the field to the start. Nemechek slides from the bottom to the top in turn 1. He leads off turn 2. Lap 3, Braden Mitchell is tangled with another truck down the back. The caution is out. Green, Nemechek gets a horrible launch. He falls outside the top 4. Noah Gragson takes over the top spot. 9 to go, Nemechek has climbed back to the rear bumper of Gragson. He’s looking for the lead, caution. Green, Gragson gets the jump from the outside lane. Nemechek cuts it to the bottom. He’s making up ground off turn 3. Nemechek with the slider in turn 3. Nemechek reclaims the lead! 4 to go, Otto slams the wall off turn 2. He’s trying hard to maintain his transfer position. It’s all gone wrong! Otto spins by himself off turn 2 on the next lap. He was in 3rd. The caution is out at Otto hits the pit area. Thorson is using a mop to clean off the inner windshield under the caution. Green, 2 laps to go, Nemechek leads in the outside lane. Gragson dives all the way to the inside wall in search of traction. Nemechek checks out. He takes the win in the LCQ at Eldora Speedway. 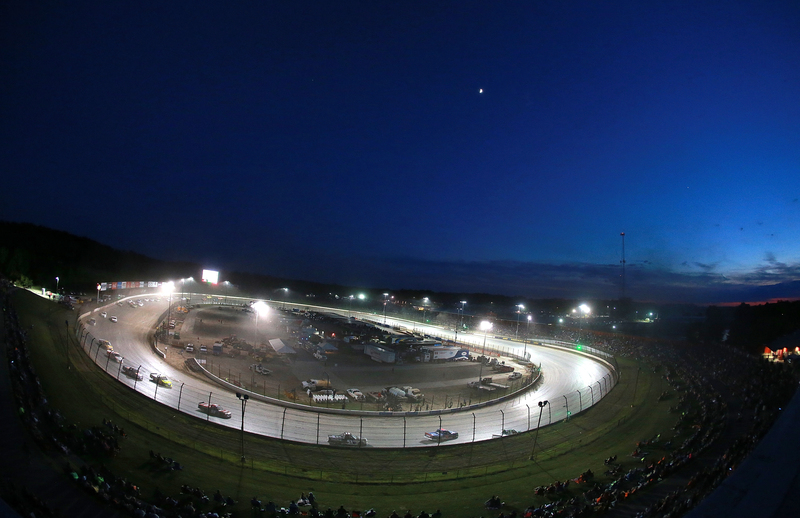 Ben Rhodes and Todd Gilliland will lead the field to the green flag at Eldora Speedway. 40 laps in stage 1, 50 in stage 2 and 60 in stage 3 will complete the 150 lap main event. Green, Rhodes takes the lead on the top. He leads into turn 1. Rhodes takes the early lead as they run 3 wide behind them. Lap 9, Johnny Sauter is around. The caution is out. Green, Rhodes leads. Friesen and Gilliland battle for 2nd. Friesen takes 2nd and aims for the leader. Friesen dives to the inside of the leader. He can’t make it stick on the bottom. Lap 20, the caution is back out. Justin Fontaine is stopped backwards against the outside wall. Green, Rhodes leads into turn 1. Friesen fights back on the bottom off turn 2. Logan Seavey sticks his nose between them as they run 3 wide for the lead. Friesen takes the lead on the bottom! Lap 28, Rhodes looks to the outside of Stewart Friesen, he retakes the lead into turn 3. Friesen is around! He tried to diamond his exit off turn 4, he came across the nose of Chris Windom who was pushing up the hill at the same time. The caution is out. Green, Rhodes leads with his outside lane selection. They fan out 3 wide behind him. 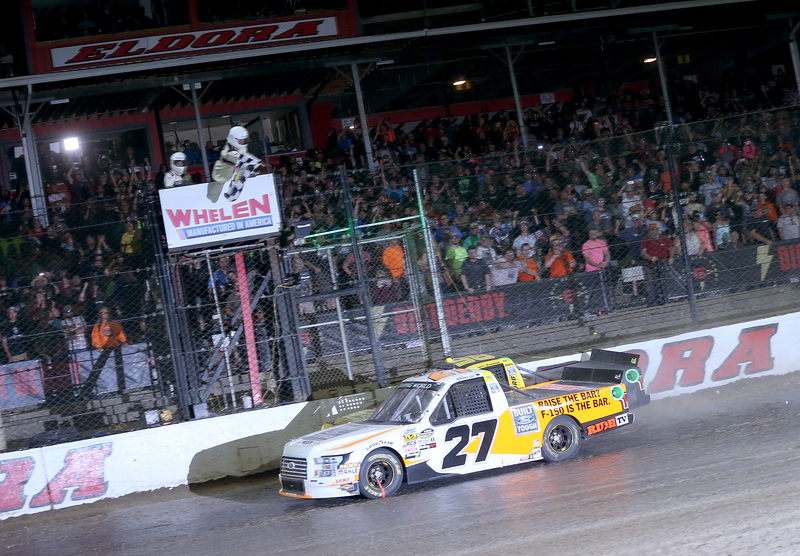 Ben Rhodes holds on to win stage 1 at Eldora Speedway! The field coast around under caution. Rhodes and Briscoe lead the field back to the green. Green, Rhodes gets the jump. Lap 45, Ben Rhodes is slow on track! He heads for the pit lane. Briscoe assumes the lead! 37 to go in stage 2, the caution is back out. Crafton has heavy damage. Tyler Dippel cut across the nose of Crafton at the entry to the corner. He spun himself across his nose. Crafton then ran into him as he skated backwards up the hill. Both made contact with the wall. Green, Briscoe leads. The track has slicked off top to bottom at each end of the race track. 2nd through 6th run nose to tail. Enfinger closes on the leader. He looks to the inside. They run side by side, lap after lap. No contact this far just great racing for the lead. Enfinger is faster he just can’t complete the pass on the bottom. Briscoe holds him off as Enfinger fades. 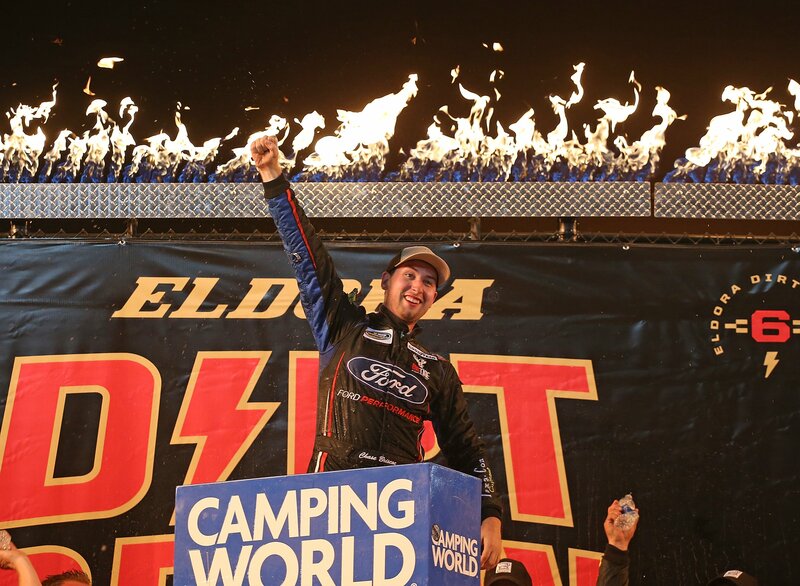 Chase Briscoe wins stage 2 at Eldora Speedway! 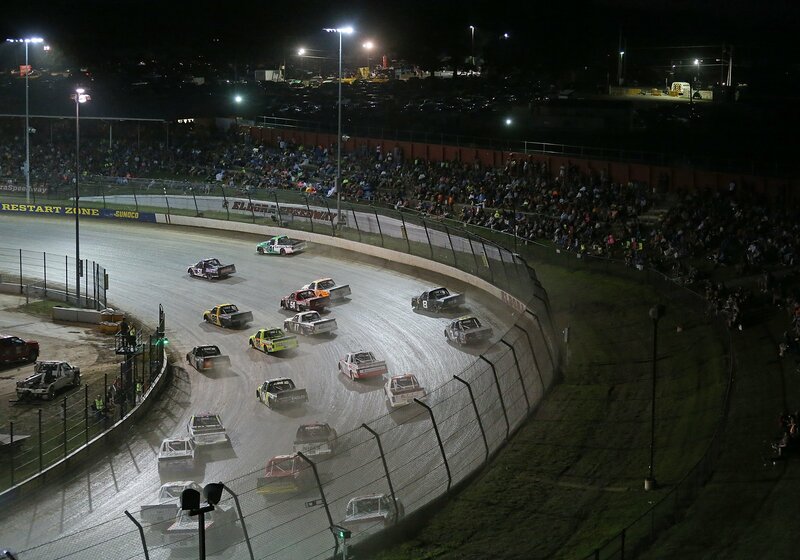 Only 60 laps remain in the 2018 Dirt Derby at Eldora Speedway. Green, Logan Seavey takes the lead. 25 laps to go, Seavey leads Friesen by 4 seconds. 20 to go, the caution is out for Dippel. A car couldn’t hold it on the bottom and clipped him in the left rear. Green, they run 4 wide for the lead off turn 2! Seavey holds them off. Spin off turn 4, several cars are collected. They’ll rack and wreck ’em again. Just 5 laps to go. Green, Briscoe cuts it to the bottom in turn 1. He slides up the hill and takes the lead from Seavey! Big crash behind them! The caution is out. Overtime at Eldora! Green, Briscoe to the bottom. Enfinger looks to the outside. He’s there! They bang fenders for the lead. 1 to go, still side by side! Final corner, Briscoe noses ahead off turn 4. He pinches Enfinger into the outside wall as they come to the line. Chase Briscoe wins the Dirt Derby at Eldora Speedway! 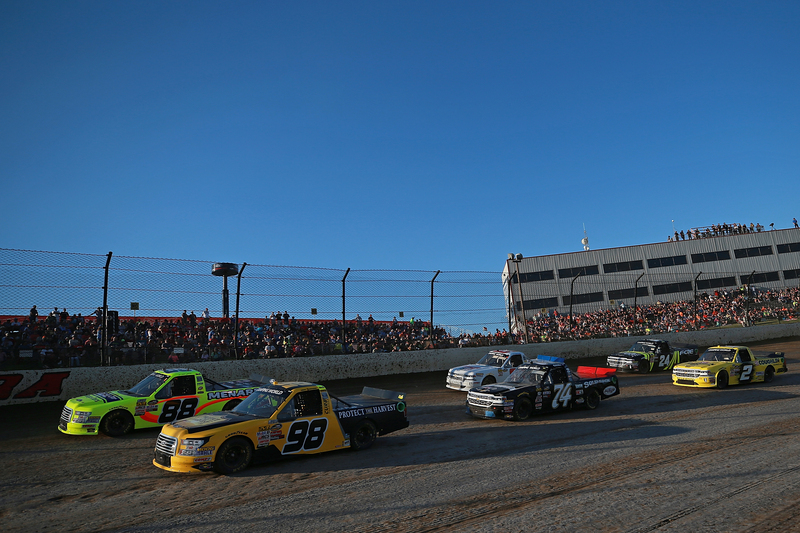 View full 2018 Eldora Dirt Derby race results below. Qualifying, heats, LCQ and main event races are posted below.